The only way I could endure being a coward was if I was the only one who knew it. I am only a peasant by position, not by nature! I will find you another long-forgotten Queen Mab poem in no time. Depend on it. I refuse to let Cody or anyone else know more about English Literature than me. So calm yourself, Elfish, and let an expert take over. 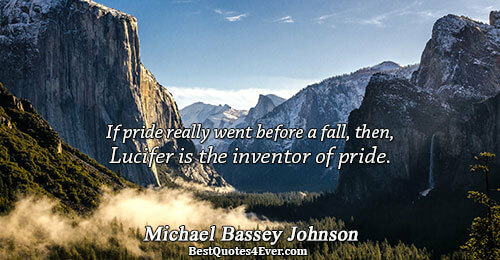 If pride really went before a fall, then, Lucifer is the inventor of pride. Adieu to disappointment and spleen. What are men to rocks and mountains? Take pride away from a man and you might as well run a knife through his heart. It ain't bragging if you've done it. There's nothing wrong with being proud of doing something well. In fact, if you intend to do something creative for a living, it's absolutely essential. [check for wording] Proper pride says, "I'm good at this." Improper pride says, "I'm better than you. Author describes that a failed sea captain, "vacillated miserably between self-recrimination and defensiveness. Matthew Arnold made the horrible prophecy that literature would increasingly replace religion.